Socrates Poole and Brisco County, Jr.
Oh, yeah. All that and more, if that’s possible. 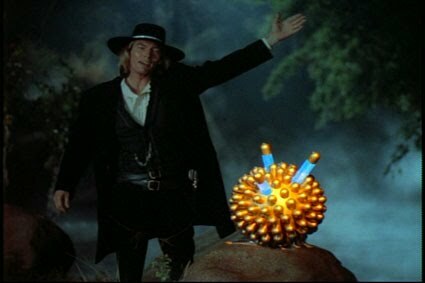 Welcome to The Adventures of Brisco County Jr. 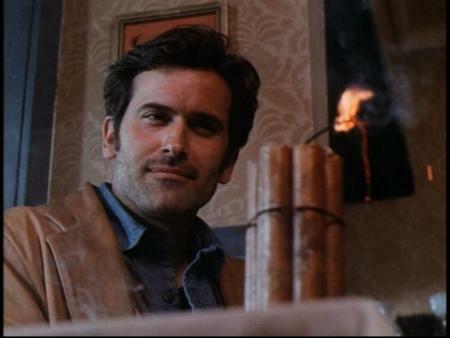 It starred genre favorite Bruce Campbell as the Harvard-educated bounty hunter and forward-thinking western hero. The storyline detailed Brisco’s attempts at finding justice for the murder of his father (chronicled in the pilot). 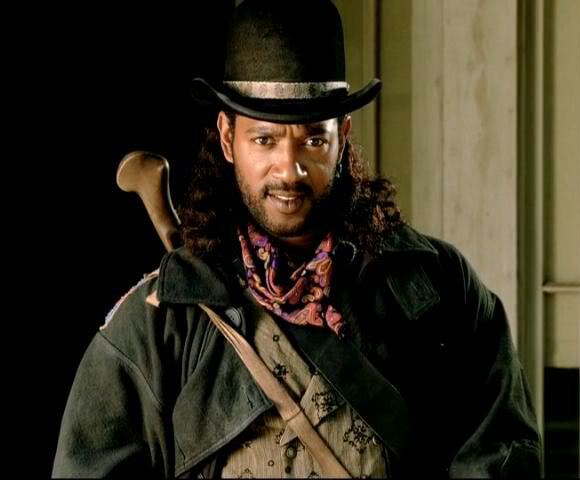 On retainer for a group of wealthy businessmen, he also would take on various missions, provided by his not-quite heroic contact Socrates Poole (Christian Clemenson) and joined on various travels by Lord Bowler (Julius Carry), the self-proclaimed “best bounty hunter ever”. The stories were traditional western fare, but with a thick veneer of comedic timing, sly modern-day references, and clever and fun characterizations. Brisco often talked of “…the coming thing”, usually referring to some type of invention or idea that was brand new in the 1890’s West, but was really a reference to something in our current society. Everything from an “innerspace suit” (an underwater diving suit that looked a lot like something an astronaut would wear) to “cowpies” (ground up meat formed into a pie shaped patty and put between to pieces of bread, the introduction of the hamburger). Many of these “futuristic” inventions were created by Professor Wickwire, played with delightful lunacy by Addams Family actor, John Astin. Of course, usually these inventions weren’t quite perfect, which explains why they didn’t immediately catch on in the 1890’s…. Who could resist Dixie Cousins? And as for the actual sci-fi, the continuing mythology over the course of the season involved the finding of “The Orb”, a mysterious item that bestowed amazing powers upon it’s owner… and (spoiler alert) ultimately involved resurrection, time travel, and a naked woman from the future. Yeah, it’s a typical western, all right…. There was also a nice nod to the movie serial origins of the “sci-fi western”, in which each half of the episode opened with an on-screen graphic dividing the show into “acts”. This was likely done in the hope that the show would ultimately be syndicated in reruns as a half-hour show, with cliffhanger endings (appropriate for a movie-serial type show). The show did make it into repeats, airing for two years on Saturday mornings , but in the original hour form on cable station TNT. During its original FOX run, this odd, quirky, western-comedy-fantasy was paired on Friday nights with the debut season of The X-Files, which, although both might be somewhat sci-fi in flavor, are thousands of miles apart thematically. X-Files ultimately got moved off of Friday nights, onto Sundays, and became a nine-season success with two theatrical movies, while Brisco only got 27 episodes… and lots of memories. Although Brisco was thought to be a hopeful renewal for the next season, the series caught a lot of heat from an unexpected source: The NCTV (National Coalition on Television Violence). The NCTV was a supposedly watchdog type organization, dedicated to “family values” and “cleaning up” television. According to the NCTV, The Adventures of Brisco County Jr. was the single most violent television series on the air that season. I will go into more detail of the methods and attitudes of this organization (and others like them) in another post, but the practical upshot of this publicity was that FOX really was being publicly pressured to remove the show from their schedule. Pressure was also brought to bear politically, with headline seeking congressmen (led by Paul Simon of Illinois) advocating the elimination of television violence, especially in the 8/7 hour. Now for the revelation: The NCTV counted up violent acts on every network show on TV for a whole ONE WEEK! So any particular show’s rating was based on a single episode! That week’s episode, titled Riverboat, involved a con game that had Lord Bowler participating in, not one, but TWO boxing matches (one of them rigged! ), and then counted EVERY SINGLE PUNCH as a violent act. Grand total, as reported in the media (WITHOUT the context of the boxing match included, by the way)–A whopping 117 “violent” acts per hour–on average, better than one every thirty seconds!! Take out the boxing matches, and you probably eliminate 75% or more of the “rating”. So, it wasn’t even the typical western-style gunfights or deaths that got them the “violent” rating. It was some boxing matches, one of them a rigged dive that lasted only one punch! Did I mention that Brisco almost NEVER uses his gun? Actively avoids it whenever possible? And this fact is a plot point? Brisco only actually kills ONE villain in the series himself, and then only in the circumstance when it’s completely in self-defense, and that’s in the second episode filmed and deliberately never repeated. 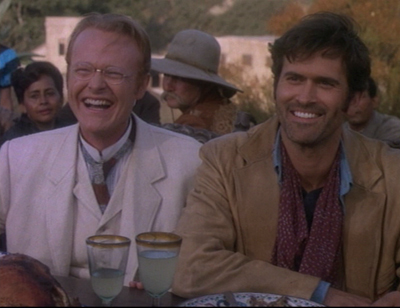 Brisco County was one of the best rated shows ever to die after a season. A show that cost as much to film as Brisco did (with location shooting, period costumes, sci-fi special effects, etc. ), and only pulling moderate ratings, was a borderline renewal anyway. The negative publicity (and theoretical positive publicity if it was gone, showing what a “responsible” programmer FOX was), ultimately led to the cancellation of the show. BRUCE CAMPBELL (Brisco County, Jr.) was well known to genre audiences as the hero of the Evil Dead and Army of Darkness series of movies. After Brisco, he returned in 20 episodes of Hercules and Xena as the rogue “Autolycus”, then starred for one season in the half-hour action-comedy Jack of All Trades. Many guest spots followed through the 2000’s, including cameos in the three Spider-Man movies. Most recently, he’s been a supporting regular in the USA network series Burn Notice. CHRISTIAN CLEMENSON (Socrates Poole) has had a hugely successful career, with three Emmy nominations for his role as Jerry Espenson on Boston Legal, and winning in 2006. In addition to many TV guest spots, he now appears on CSI: Miami. JULIUS CARRY (Lord Bowler) got to get at least a small measure of irony while playing the recurring part of a network honcho on Murphy Brown for 4 years. Julius passed away after a battle with pancreatic cancer in 2008. JOHN AUSTIN (Professor Wickwire) has had an extensive television career, known for playing odd and eccentric characters. Best known for his starring turn as Gomez in The Addams Family, he also starred in the cult comedy I’m Dickens, He’s Fenster, and the TV version of Operation: Petticoat. Significant TV guest work includes parts in The Twilight Zone, Batman, and Eerie, Indiana, and a recurring part as Buddy in Night Court. Astin toured the country in a one-man stage production of Edgar Allan Poe: Once Upon a Midnight, and currently is a teaching professor of drama at Johns Hopkins University. KELLY RUTHERFORD (Dixie Cousins) could well be the signature icon for actresses with the best parts in short-lived series. Before Brisco, she appeared in the show Homefront (lasted 20 eps). After Brisco, she had regular or recurring parts in the series The Great Defender (8 eps), Courthouse (4 eps), Kindred: The Embraced (7 eps), an atypical stint in Melrose Place (90 eps, believe it or not! ), then Get Real (4 eps), The Fugutive (3 eps), The District (3 eps), Threat Matrix (16 eps), and E-Ring (20 eps). Finally, she caught another extended run, appearing on Gossip Girl (60 eps and counting). The show was created by Jeffrey Boam and Carlton Cuse. Boam came originally from movies, having written some of the Lethal Weapon series, as well as The Lost Boys and Indiana Jones and the Last Crusade. He died in 2000 from heart failure after contracting a rare lung disorder. Cuse has been a successful TV producer, creating and producing the series Martial Law, Nash Bridges, and the hugely successful (and just as quirky and time-travel filled) Lost. Oh, and we can’t forget the final member of the team. Brisco’s horse, C OMET, was actually listed as an actor in the opening credits (and therefore gets a listing on IMDB), and appeared in 11 episodes. Comet actually was a character in the show, as the horse could supposedly understand whatever Brisco would say to him. Comet also actually thinks of himself as a person, and NOT a horse…. Looking for "the next big thing"
Further resources for the avid Brisco County fan are available at The Ultimate Brisco County Jr. Guidebook, and Warner Bros. Home Video has an excellent site for the DVD. Episodes are also available for online streaming at The WBtv website. Odd trivia: The theme for Brisco County Jr. ended up being used for many years as the bumper music in and out of commercials for NBC’s Olympic coverage. Brisco was certainly Gold Medal worthy!